194 pages | 9 B/W Illus. At the heart of modern democracy lies the public sphere, which is most centrally shaped by those actors that integrate it discursively: the mass media. The media draw together the different strands of political debates; they grant access to some actors and arguments while excluding others and thus decisively mould the political process. 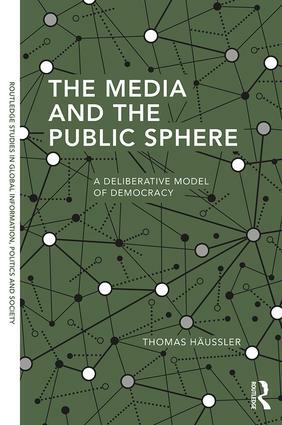 In this book, Thomas Häussler examines how the media reflect and react to the wider context in which they are embedded. More specifically, he focuses on whether their discourse demonstrates systematic differences with regard to the two main public sphere types that they co-constitute, according to deliberative theory, focussing in particular on the work of Jürgen Habermas. The Media and the Public Sphere promotes a deeper and more detailed understanding of the political process by foregrounding the complex relationships between the media and the public discourse they constitute. It examines how the media co-create relationships of power, analyses the structure of these discursive networks and illuminates the effects that different deliberative coalition types have on political debates. Thomas Häussler is a post-doctoral researcher and lecturer at the Institute of Communication and Media Studies, University of Bern. His research interests include political communication; online mobilisation and campaigning of civil society actors; social (online) network analysis; (Swiss) media history; and social and political philosophy – in particular, theoretical models of and empirical research on deliberative democracy. He teaches courses at bachelor’s and master’s levels on different aspects of political communication.